Love was the last thing Todd Webster Morgan expected to find while searching for gold in 1870s California. But that was before he met Lâo Jian. Hooray for Todd Webster Morgan and all his stubborn, adorable, loving aways! I started reading The Celestial with some minor apprehensions. You see, I’m don’t tend to read or enjoy historicals, so in a way this poor darling of a book was already on the back-foot before I’d even turned the first page. But never you mind, I think it’s darn near impossible to not fall for MC Todd Webster’s charms. 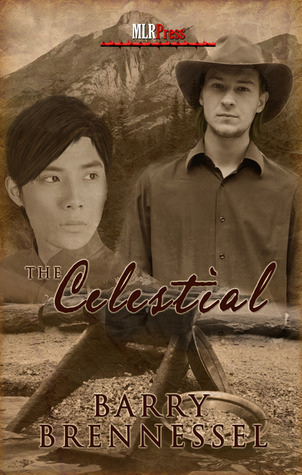 The Celestial is written in Todd’s first person POV. Through his narration, we see a young man (just shy of 20 years old) who lives his life with empathy and love. We see how he follows his heart in all he does. We see the sweet interest between two young men gently sway to fondness, then attraction and then love. “A hand clutched my shoulder. Before I could see who it was, I felt the warm breath on my cheek. We also see the cruelty of racism which is aimed at Låo Jian and his people. Alongside that we see Todd Webster’s unwavering devotion to the person he loves – regardless of gender or race. And that’s beautiful; true romance and and humility at it’s finest. Agreed. I loved Todd! And Lào Jian. And Barry Brennessel. I enjoyed this, and I think it works as YA or adult reading, giving readers a feel for an historical period we don’t hear much about, and cultural differences as well. This entry was posted on October 8, 2014 by Sue in Historical, Reviewer: Sue and tagged 4 Stars, barry brennessel, mlr press.